Whether you're planning a trip to Morocco, Egypt, or any of the 25 exotic countries where Arabic is spoken, you'll want to bring along your language skills and ARABIC in 10 minutes a day® is just the ticket! With a focus on practical words and phrases which every traveler needs, the book and interactive software provide an easy, step-by-step approach together with useful study tools and fun, computer activities and games. Perfect for students, travelers and international executives worldwide! The 10 minutes a day® Series is your first step in language learning. This program lays the groundwork to springboard you to the next level. You'll understand how the components of the language work so you'll have the freedom to use the language for any situation. The 10 minutes a day® method guarantees success—all you need to do is set aside 10 minutes a day. When you do a little bit every day, you reinforce your learning and progress quickly. Whether you're doing the exercises or playing with the interactive modules, being consistent every day will help you to become comfortable and make this new language yours. The program is designed so you can work at your own pace. There is no set speed or time limit. If you want to do more than 10 minutes a day, keep going. Just remember, let the process be fun. Designed to look like a child's workbook, the 10 minutes a day® book is an approachable and fun program for everyone. It covers the material equivalent to more than a year of high school Arabic or the first quarter of Arabic at university. It's a refreshing alternative to boring textbooks and you'll be surprised at how much you learn. The program focuses on words you'll use when traveling. You'll learn Key Question Words so you can ask for what you need; money and numbers so you can shop and pay bills; directions so you can get around town smoothly, and so much more to make your experiences abroad enjoyable. Study aids and fun activities such as word games, puzzles and interactive modules are academically sound and strategically interwoven into the program. They're engaging and most importantly, they're designed to help you succeed. Interactive software, Sticky Labels, and Cut-out Menu Guides make learning more playful. Do an exercise in the book then place your Sticky Labels around your home. Use the interactive software to review during coffee breaks. Take the Cut-out Menu Guide to your local restaurant and practice ordering in your new language. It's just that easy and it's just 10 minutes a day! Use the book to guide you, step-by-step, through learning and speaking Arabic. Color illustrations and an easy-to-read format visually engage you. Place the Sticky Labels around your home and office to learn new words without any extra time or effort. Use the interactive Sticky Labels module on your computer to hear the words, practice and improve. Take the ready-made Flash Cards with you and review your vocabulary on the go. Use the interactive Flash Card module on your computer to hear the words and test yourself. The Arabic alphabet: Use this lesson to learn the Arabic script. Write each letter and become familiar with its pronunciation. 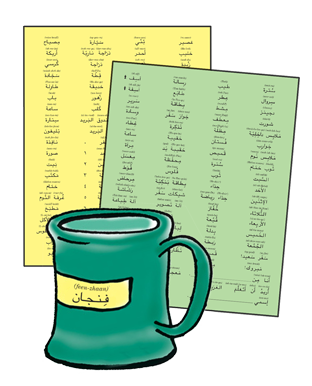 With a little practice, you'll be on your way to reading Arabic in the very next lesson. Practice at your local restaurant and take it on your trip. With the Guide and simple phonetics above each Arabic word, it's easy to begin speaking Arabic with the correct pronunciation. Sounding similar to their English counterparts, these Arabic words take no extra effort to add to your vocabulary. You can quickly look up an Arabic word, its pronunciation and definition. ARABIC is spoken in . . . Algeria, Bahrain, Chad, Comoros, Djibouti, Egypt, Eritrea, Gaza Strip, Iraq, Israel, Jordan, Kuwait, Lebanon, Libya, Mauritania, Morocco, Oman, Palestinian State, Qatar, Saudi Arabia, Sudan, Syria, Tunisia, United Arab Emirates, Yemen, and Western Sahara.